Manny Ramirez has been released by the Oakland Athletics. Yes, that Manny Ramirez. On Friday, Manny asked the A’s to release him and the club quickly granted his request, making the 40 year old outfielder a free agent once again. The Dominican Republic born outfielder has hit 555 career home runs and driven in 1,831 runs during his Major League Baseball career and it appears that the 12-time All-Star may have played his last game in “The Bigs”. The decision to release Ramirez was a mutual decision between the player and the franchise. The slugger signed a minor league deal with the team on February 20th, a deal which called for Manny to receive a $500,000 dollar salary if he were to make the major league roster, of course after he served his 50-game suspension for performance enhancing drugs (he was caught with fertility drugs in his system, commonly used as a masking agent). Manny sat out his ban, and on May 30th of this year he was eligible to play again in the majors. In 17 games with the Athletics AAA minor league affiliate Sacramento River Cats, Ramirez hit .302 with 14 RBIs, but lacked his usual power and did not homer and held only a .349 slugging percentage. Apparently that display was not enough for the A’s to call Ramirez up to the major leagues, and here we are just over weeks since becoming eligible and Manny is no longer with the organization. In an interview with ESPNDeportes.com’s Enrique Rojas, Manny said “the A’s treated me amazingly during all this time, but sadly didn’t have a place for me and this is something I can’t control. I’m going home to continue my training hoping to get the chance to play again. I’ll be waiting for that call and if God believes (playing) is the best for me, then it’ll happen. If not, I’ll understand”. Manny also said that it was an “amazing experience” and that he was “ready to play, but Oakland didn’t have a space on its roster” and that he understood the situation. Business is business and it’s not really a surprise that the A’s decided not to take a half million dollar risk by calling him up to the major league club, but if this is the way that Manny’s career ends that would be a bummer. When I heard the news last night, watching former Red Sox catcher and first baseman Scott Hatteberg (also of Moneyball fame) in the booth broadcasting the Athletics game against the San Diego Padres, I turned to my friend and asked him what he thought of the release. I also made mention of the current Red Sox outfield and he told me to not even get started on any talk of his return, but it is something that I would love to see. 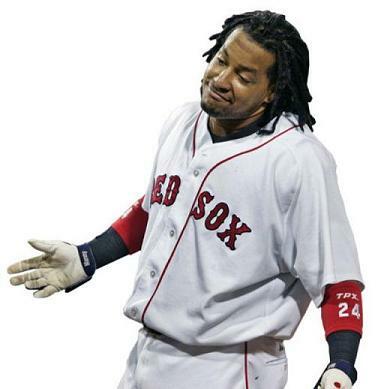 I’ve said it before and I’ll say it again, Manny Ramirez is one of the best right-handed hitters of my generation (.312 average, over 2500 hits) and he is also one of the few 2-time World Series Champions from the Red Sox of the 2000s. Manny is a 9-time silver slugger award winner (awarded to the best offensive player at each position as determined by coaches and managers) and even if he doesn’t have the power he once did that short porch in left-field at Fenway is pretty enticing. Will the Red Sox even entertain the thought of bringing him back, no stinking way, but it is an interesting thing to think about. My feeling is this is the end of the road for Manny. The end comes for everybody and for him to even be playing minor league ball at 40 years old is impressive it its own right. The A’s gave him one more chance to prove himself and see if he could still play and it from the looks of it the experiment produced nothing conclusive. Will his phone ring like he’s hoping, I doubt it, but this is Manny Ramirez we’re talking about. Anything is possible with him. He’s just Manny being Manny. This entry was posted in MLB and tagged Athletics, Baseball, Manny Ramirez, MLB, Red Sox, Sports. Bookmark the permalink.